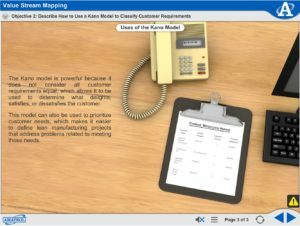 Amatrol’s Value Stream Mapping Multimedia Courseware (MXLM308) covers topics like Value-Added Processes, Current State Value Stream Mapping, creating and implementing a Future State Value Stream Map, and the preparation and implementation of Value Stream Mapping. Within these topics, learners study objective like: using a Kano Model to classify customer requirements; identifying Value Stream Map Icons; interpreting and defining the importance of a Product Family Matrix; applying a Product Family Matrix; using a Line Balance Chart; tabulating a Value Stream Box Score; calculating a Value-Added Ratio; and creating and analyzing SIPOC diagrams and Swim Lane Flow Charts. 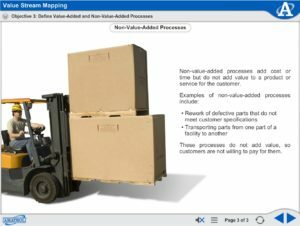 Value Stream Mapping is a key process analysis tool used throughout the implementation of lean production. 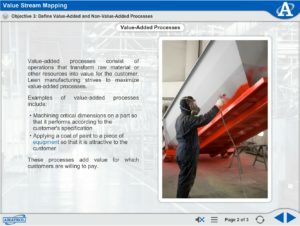 Value stream maps feature graphical representations of all necessary activities in a process that transforms raw materials or the other resources into a product or service that has value to a customer. This usually includes everything that occurs from the point of customer order to receipt of payment for the delivered product or service.